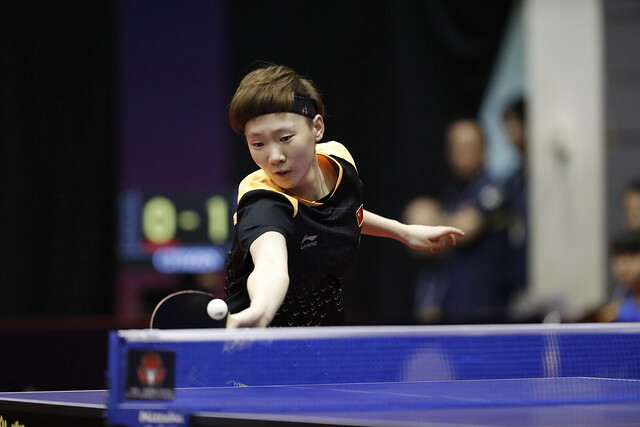 Impressive performances on the penultimate day of play, Saturday 9th June, at the Seamaster 2018 ITTF World Tour Lion Japan Open in Kitakyushu; China’s Liang Jingkun and Chen Xingtong imposed their authority on proceedings to secure the Mixed Doubles title. The win meant that for the second successive week it was success for Chen Xingtong; some seven days earlier she had partnered colleague, Lin Gaoyuan to success in Shenzhen. At the final hurdle the no.8 seeds, they beat the host nation’s Maharu Yoshimura and Kasumi Ishikawa, the reigning World champions and top seeds, to arrest the title (11-9, 11-9, 11-9), having one round earlier accounted for Hong Kong’s Ho Kwan Kit and Lee Ho Ching, the no.4 seeds (7-11, 11-9, 11-6, 11-7). Two titles in a row for Chen Xingtong; she is very much following in the footsteps of her colleague, Cao Zhen. She won the Mixed Doubles title at the H.I.S. 2009 World Championships in Yokohama in partnership with Li Ping, before succeeding two years later at the GAC 2011 World Championships in Rotterdam in harness with Zhang Chao. Both Li Ping and Zhang Chao described Cao Zhen as the ideal partner; it is very much the same in the guise of Chen Xingtong. In the opposite half of the draw, at the semi-final stage Maharu Yoshimura and Kasumi Ishikawa had beaten Korea Republic’s Lee Sangsu and Choi Hyojoo the no.7 seeds (11-5, 11-6, 11-5).